Alpacas, part of the camelid family (which also includes camels, llamas, vicunas, and guanacos) are graceful herd animals indigenous to the South American Andes Mountains. Their fleece was cherished by members of the Incan civilization and is now in high demand in the North American markets. Alpacas produce one of the world's finest and most luxurious natural fibers. It is clipped from the animal without causing it injury. Soft as cashmere and warmer, lighter and stronger than wool, it comes in more colors than any other fiber producing animal (approximately 22 basic colors with many variations and blends).The cashmere-like fleece, once reserved for Incan royalty, is now enjoyed by spinners and weavers around the world. Alpacas eat grasses and chew a cud. 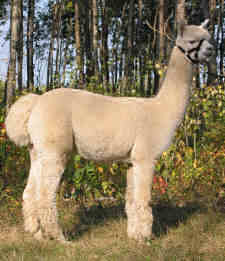 Adult alpacas are about 36" tall at the withers and generally weigh between 100 and 200 pounds. They are gentle and easy to handle. Alpacas don't have incisors, horns, hooves or claws. Clean-up is easy since alpacas deposit droppings in only a few places in the paddock. They require minimal fencing and can be pastured at 5 to 10 per acre. Alpacas have soft padded feet, making them gentle on their pastures, and they have no top teeth in the front. The average height of an alpaca is 36" at the withers, and they weigh from 100 to 175 pounds. Alpacas are small and gentle enough to travel short distances in the family minivan and are easily handled by most people. A female alpaca's gestation period is 11 to 12 months, and they have single births (twins are extremely rare). A baby alpaca, called a cria, usually weighs between 15 and 20 pounds. The suri alpaca evolved from the rare and still wild vicuna. The alpaca is also cousin to two other camelid family members: the llama and the guanaco. Treasured by Inca rulers, suri fiber was reserved exclusively for Inca royalty, with the offense of anyone other than royalty wearing sure fiber punishable by death. The very unique, rope-like, twisted locks of the suri easily distinquish that fiber style from the compact, spongy or often fluffy huacaya fiber appearance. These long fibers hang parallel to the body sides and neck, falling from the midline of the back in individual locks which contain groups of straight fibers, without evidence of crimp. Today it is estimated that less than 120,000 suris exist word wide, with one or two percent of these being colored. On the world market, the suri fleece is in high demand for its luster and softness for the high fashion textile markets, and today commands a price double of that for huacaya. 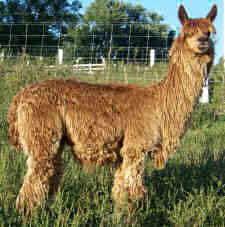 Suri alpacas have extraordinary vigor and intelligence. They are also easy to raise and have great adaptibility to both hot and cold climates which makes them an excellent investment in the stongly growing natural fiber textile industry.